Mirvac has launched the latest, golf-side precinct at its Gainsborough Greens community in Pimpama, following the $10 million sell-out of its golf-front lots in the Terrace Green release. The new Forest Green enclave is located beside the Gainsborough Greens Golf Course and a large park and playground area, and will include an exclusive resident-only recreation hub with resort-style swimming pool, barbeque area and tennis court. The release of the first stage of 29 homesites, priced from $199,000, in Forest Green has been brought forward to meet growing demand for land beside the golf course. 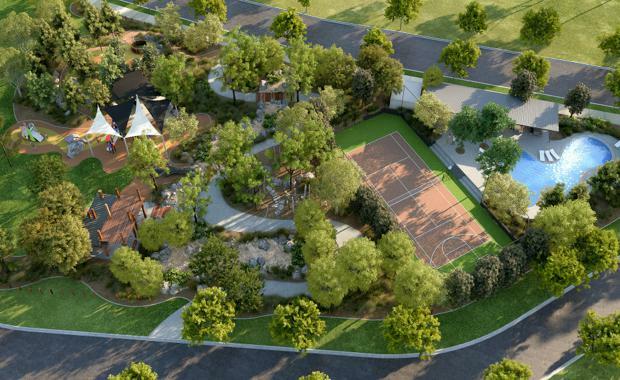 Mirvac’s Development Director, Masterplanned Communities, Queensland, Russell Berlee, said Forest Green would appeal to lifestyle oriented buyers looking for an affordable opportunity to secure a homesite nestled beside a golf course or parkfront with a range of facilities at their doorstep. "Terrace Green was our first golf-front release at Gainsborough Greens offering fairway lots and access to exclusive on-site amenities and with all homesites now sold, we decided to bring forward the next release of land to fill demand for this style of living," he said. "The Forest Green homesites will be situated within the body corporate precinct, which provides purchasers with 24-hour security and confidence in the quality of the homes and community facilities at their new address. "The ability for purchasers to live in this style of community and build their own architecturally designed home is a big plus - in many body corporate environments the homes often have a similar design and people are unable to put their own stamp on the facade. "There will be a good mix of lots available ranging from a compact 300 square metres through to 852 square metres, with eight homesites in stage one backing onto the golf course green open space, with the balance boasting proximity to the community park or recreation centre. "Forest Green has added appeal because of its unique location within a pocket of conservation forest area. It is also located near a proposed new Catholic school, which will soon complement the existing state primary and secondary schools in the area. "Mr Berlee said homesites in Forest Green were expected to be titled and ready to build on from the middle of 2015. He said Mirvac was currently offering a $5,000 deposit until settlement for early birds, for those who acted to secure their choice of land now. "With interest rates at a historic low and the rare opportunity to buy into a body corporate environment in a well-established community like Gainsborough Greens, we are expecting strong interest from purchasers," said Mr Berlee. "We expect the new release to appeal to a wide variety of buyers, including young families and retirees. Gainsborough Greens will comprise about 2,200 homes across a series of interconnected villages and parklands.